In 2006, Mary Hughes and David Vermillion purchased a 32-acre farm for the purpose of growing grapes. They chose this Shenandoah Valley location specifically because of its suitability for growing grapes: limestone-based soils, low humidity and rainfall, and reliable daily breezes as well as the slopes and elevation. The ripening grapes also benefit from cool night-time temperatures in August and September, which permit sugar to increase without loss of the acidity that provides the necessary structure and balance found in fine wine. 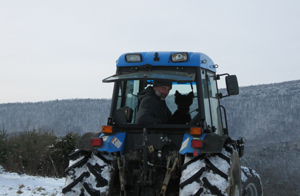 Mary and David planted the first grapevines in 2008. The red grape varietal they chose,cabernet sauvignon, requires a very long season in order to become fully ripe so they planted it on a south-facing slope at 1330 feet of elevation. In succeeding years, they added additional red grape varieties, some of which are quite unusual in Virginia: Tannat, Lagrein, Refosco and Sagrantino. 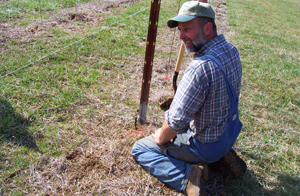 These small lot plantings are experimental in nature to see what red grapes would be suited to this Shenandoah Valley site. Unfortunately, the double polar vortexes of 2014 proved that certain of these varieties are not sufficiently cold tolerant to thrive in the Valley, and they will gradually be replaced with hardier varieties. The Cabernet has thrived and still forms the backbone of Jump Mountain’s red wine production. In 2012, they built trellises on a northeast facing slope across from the Cabernet vines to plant an acre of Gruner veltliner, an Austrian white wine grape valued for its refreshing acidity and aromatic qualities. Gradually other white grape varieties will be added to this cooler hillside where conditions protect the more delicate white grapes from excessive heat and sunscald. 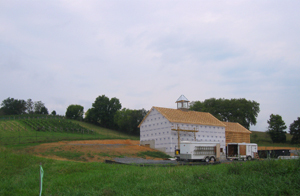 Jump Mountain Vineyard’s wine production began in 2012 with the construction of the winery building. Designed by architect Samuel A. (Pete) Anderson, III, FAIA, the building takes advantage of the sloping site to provide a gravity-based wine production facility and an earth-sheltered cellar for aging the wine at a constant 50-60 degree temperature range. Situated to offer views of local landmark Jump Mountain as well as thevineyards, the winery also contains a tasting table where guests are offered samples of the estate grown wines as well as tours, if desired. In the future, a full tasting room and outdoor patio will be added. All in all, this has been a very personal adventure for the owners , who have developed the vineyard and winery shaped by the character of the local rural landscape. Protected by the sandstone knob of Jump Mountain, the micro-climate and soils found here create conditions conducive to growing vinifera grape varieties. The distinctive profile of Jump Mountain that is featured on logo and labels represents the combination of geology, climate and cultural heritage that shapes the character of the wine. All information provided in official Jump Mountain Vineyard website is for information purposes only and does not constitute a legal contract between any person or entity unless otherwise specified. Information on this website is subjected to change without prior notice.